Situated in the South-Western part of the country, on both sides the Cerna river, reaching till the foot of the Dormogled Mountain Mass, Baile Herculane is a natural reservation famous for its variety and riches of its flora. The resort is the oldest one in Romania among all resorts and it was founded almost 2000 years ago. (1825 years since its foundation were celebrated in 1978). Baile Herculane lie at 160 m altitude and because of some relief particularities, the climate is mild, having Mediterranean influences. The annual average temperature is +9,3 C degrees. The winds are weak, the rainfall is reduced. The place is also dominated by mild winters, short, early springs and cool summers. The cloudiness is less present, and therefore the clear days start in March and end in October. Because of the increased thermal and mineral effects, the physiological agency of the waters in Herculane is very complex and their therapeutic value is high. 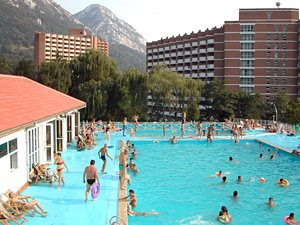 The temperature of the thermal waters alternates between 41 C degrees and 60 C degrees. The waters are sulphurous, calcic, magnestic. The multifold landscape, the amazing flora and fauna, the pleasant climate, the picturesque surroundings, all of these make Baile Herculane to be a favourite place for holydays, relaxation and active rest. 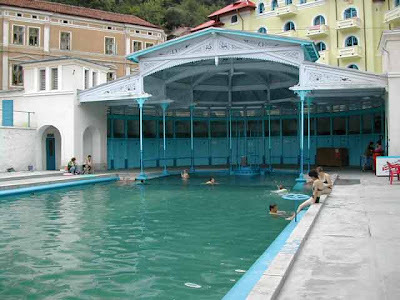 In modern times, the spa town has been visited for its natural healing properties: hot springs with sulfur, chlorine, sodium, calcium, magnesium and other minerals, as well as negatively ionized air. Before World War II, it remained a popular destination with Western Europeans, who lent the town a refined elegance. During the Communist rule, mass tourism facilities were built, such as the tall concrete hotels which dominate the skyline. It was especially popular with retirees, who would spend their state-allotted vacation vouchers there, hoping to improve their health. Today, they share the town with a younger crowd, attracted by its beautiful mountain setting. Although very beautiful, may of the Austro-Hungarian buildings are now derelict including many of the baths.